Israel's ambassador to the UK has apologised after a senior member of his staff was secretly filmed saying he wanted to "take down" Foreign Office Minister Sir Alan Duncan. He told a reporter that Sir Alan was creating "a lot of problems". Ambassador Mark Regev said this was not the embassy or government's view. 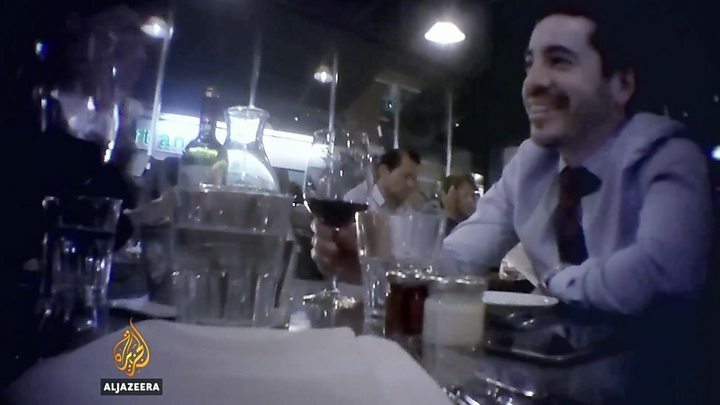 The conversation involved Mr Masot and Maria Strizzolo, an aide to education minister Robert Halfon, the former political director of Conservative Friends of Israel, as well as an undercover reporter. It was recorded in October 2016 as part of an investigation by Al Jazeera. The BBC understands that Ms Strizzolo has resigned from the civil service. Mr Masot asked her: "Can I give you some names of MPs that I would suggest you take down?" Ms Strizzolo replied that all MPs have "something they're trying to hide" and Mr Masot responded by saying "I have some MPs", adding "she knows which MPs I want to take down" before specifying "the deputy foreign minister". Image caption Shai Masot said Foreign Office Minister Sir Alan Duncan (pictured) was creating "problems"
Sir Alan, who has described expanding Israeli settlements as a "stain on the face of the globe", was seen as more of a problem than Foreign Secretary Boris Johnson - who was "basically good", according to Mr Masot in a transcript of the conversation. "He just doesn't care. He is an idiot but has become minister of foreign affairs without any responsibilities. If something real happened it won't be his fault... it will be Alan Duncan." Sir Alan launched a scathing attack on Israel in 2014, when MPs backed Palestinian statehood, deeming Israeli settlements as an "act of theft". "Occupation, annexation, illegality, negligence, complicity - this is a wicked cocktail which brings shame on Israel," he told BBC Radio 4's World At One programme. Sir Alan, who was special envoy to Yemen and Oman at the time, said "international law must be upheld" to prevent further settlements. Labour has demanded an immediate inquiry into the extent of Israeli "interference" in British politics. Shadow foreign secretary Emily Thornberry said improper interference was "unacceptable whichever country was involved" adding Mr Masot's comments were "extremely disturbing". She said it was a national security issue and that the Foreign Office's response was "not good enough". Crispin Blunt, Foreign Affairs Select Committee chairman, said Mr Masot's "apparent activity" was "formally outrageous and deserving of investigation". Lord Stuart Polak, director of Conservative Friends of Israel, said: "We utterly condemn any attempt to undermine Sir Alan, or any minister, or any member of Parliament." Ms Strizzolo told the newspaper that her conversation with Mr Masot was "tongue-in-cheek and gossipy". In a statement, the Israeli Embassy said it "rejects the remarks concerning minister Duncan, which are completely unacceptable". "The comments were made by a junior embassy employee who is not an Israeli diplomat, and who will be ending his term of employment with the embassy shortly," it said. "Ambassador Regev on Friday spoke with minister Duncan, apologised for the comments and made clear that the embassy considered the remarks to be completely unacceptable." A Foreign Office spokesman said: "The Israeli Ambassador has apologised and is clear these comments do not reflect the views of the embassy or government of Israel. "The UK has a strong relationship with Israel and we consider the matter closed."